QC tools eliminate field and operator data entry of asset attribute information. Supervisors, schedulers or operators in the field can create their schedule with a single-click. Confirm you’ve selected the correct asset using “nearby” tools to find the assets closest to your location. Speed up inspections for assets that have already been inspected using our observation verification tools and review historical inspections at any time. Manage and Maintain inspection data through your GIS. With our database structure and integration experience, leverage seamless integration that communicates data to and from your pipeline GIS software. 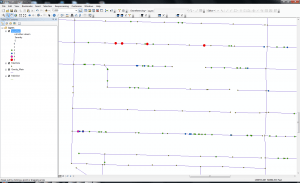 Dynamic update within the ArcMap of ITpipes inspection status for greater visibility and review options across platforms. Have confidence with thorough integration options and validation tools. Single-Click functionality for communication between systems. Incorporate ITpipes GIS integration features into your geodatabase maintenance and management processes, utilizing ESRI QC parameters. Toggle between ITpipes and your GIS, instantly plotting selected assets on the map or reviewing completed inspections for specific assets. Utilize features that allow detailed review, queries, and analysis between your ITpipes and ArcGIS Platform. Display SmartTabs on your GIS for instant visualization. Expedite maintenance scheduling, rehabilitation or CIP planning, by visual location on the map. Infrastructure Technologies is a Silver Level Partner with ESRI. For more detailed information on ITpipes integration with your GIS, request a login to SolutionSite, or contact your I.T. representative. The TechScope EZT-II is a durable single function (transverse flaw detection) console-style analog system designed to inspect drill pipe and used tubing in extreme environments. The 8-channel flaw detection system is a single-board design, same as the popular TechScope EZW-II two-function system. The electronics console consists of a heavy-duty, high-impact synthetic enclosure with sealed and removable cover. All cable connections are mounted on the top instrumentation panel. The cables have 90 degree connectors to eliminate bending. The other inspection components are the same (except the signal cable and buggy heads) as the TechScope EZW-II, (i.e. dual buggy drive, mag coils, and air jacks). Capacity includes 2 3/8” through 6 5/8” O.D.. Included is a two-channel digital/thermal printer. Computer data port is mounted on the top panel for optional DAQTech III™ data acquisition system upgrade (110 Volt AC power cable included). 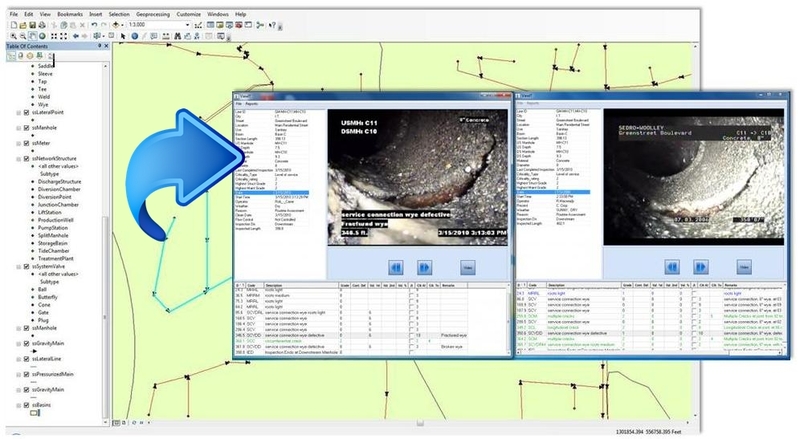 GIS ViewIT provides instant, comprehensive inspection detail available with a single click from the GIS. GIS Send is used to send assets from the GIS into the core license, pre-populating or creating a project and eliminating the operator “data entry” for asset details. This configurable module can be used for various asset types and adjusted for data transfer as necessary. 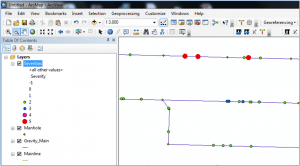 GIS Select enables users to instantly plot information between their GIS and ITpipes. This can be useful for field personnel to see their location and “nearby” assets, for users with reporting needs to plot filtered, queried reports to their map, or for users working with scheduling crews, maintenance and other planning. 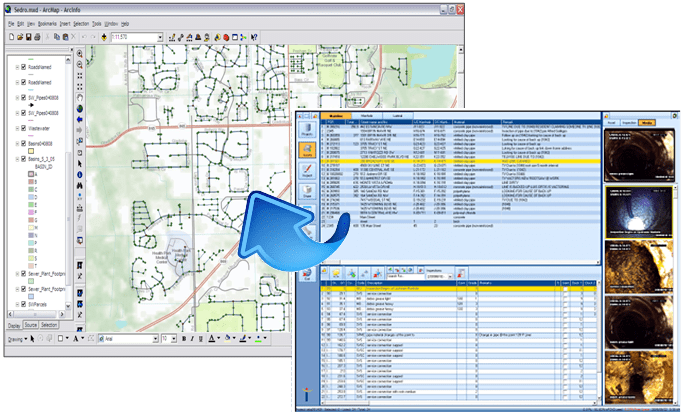 GIS Receive keeps your maps current with information direct from your field crews or your office ITpipes master database. 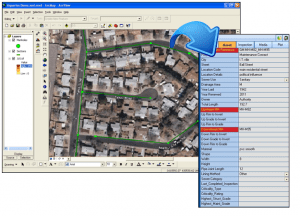 Fully configurable and controllable by your GIS admin, GIS receive uses ESRI permissions to upload data direct into your geodatabase, provides variance/discrepancy reporting for manual review, and determines data QA issues before upload. GIS Plot is for analysis and reporting! Users can instantly plot any SmartTab or filter created in ITpipes onto their GIS map. This can include asset, inspection, or observation level detail with additional information such as severity rating, infiltration level, or other analytics! GPS Receive gathers coordinates collected by your GPS into ITpipes, storing coordinates with each manhole or structure.